Manchester United manager Louis van Gaal hopes Wayne Rooney can keep their season on track by beating Sir Bobby Charlton's all-time club goals record. 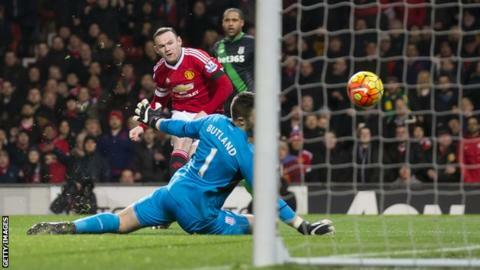 Rooney scored in United's 3-0 win over Stoke City that allowed under-pressure Van Gaal to enjoy an emphatic win. It leaves his captain Rooney just five goals behind Old Trafford legend Charlton's record of 249. "It will be good for him and good for me because when he scores we win," said Van Gaal. Jesse Lingard and Antony Martial were also on target as United remained just five points behind fourth-placed Arsenal while ending an embarrassing run of 11 home games without a first-half goal. Van Gaal, who praised the contributions of Juan Mata and Martial in a fine all-round team display, called on United to produce the consistency that will put recent troubles behind them. He said: "Mata participated in all three goals and that is what I like to see, but every player has to prove it every week - even my captain Wayne Rooney. He has to do that. Everybody forgets he was substituted against Stoke City on Boxing Day, but it is always the same with me. "You have to prove it every game and in every training session, and if you do you play. But when Rooney plays like this you cannot say to him 'come to the bench.'" Jesse Lingard's 14th-minute goal eased Old Trafford tensions - ending the run without a first-half goal stretching over eight hours 40 minutes. And Van Gaal said: "It was a great performance, not only defensively but in attack. The difference in the first half was that we scored and that made things easier. Michael Carrick said to me that when you score early like that everything goes more easily." Van Gaal took his first chance to welcome Pep Guardiola, who played under him at Barcelona, after it was revealed he will take over at rivals Manchester City next summer. "He was my captain at Barcelona so I will be very pleased to see him," said Van Gaal. "I can also speak Spanish which is convenient for him."